I’m been working in one of my Fabriano Venezia art journals again experimenting with vintage style. I started by painting absorbant ground over the double page spread then stamped the PB ‘script’ stamp in tea dye and antique linen distress inks. I spritzed the inked stamp before pressing it onto the page so I would get blurred prints. Once that dried I spread modeling paste through the PB hypnotic stencil and had to go and do something else so I wouldn’t mess it up before it was dry. Even so I still stuck my finger on it while it was wet and smudged some. Once the paste dried I spritzed the ‘see ya latte’ shimmerz spray over the pages then wiped it off the stencilled area so it would darken the background. I am not an experienced art journaller but I am using one to try things out. On this page I was trying to create a vintage look. 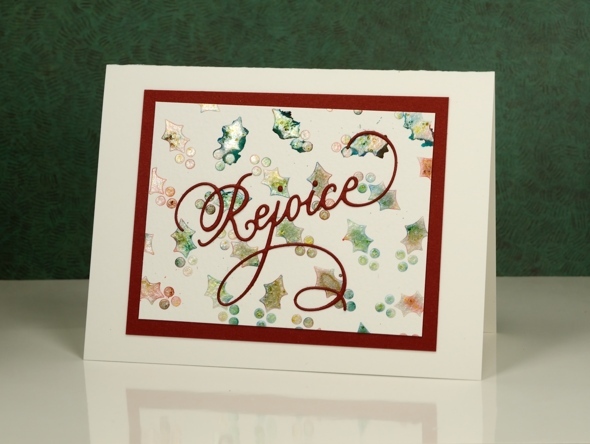 I stamped the ‘timeless’ rose stamp from Penny Black three times in brown distress inks then blended the ink into the petals. 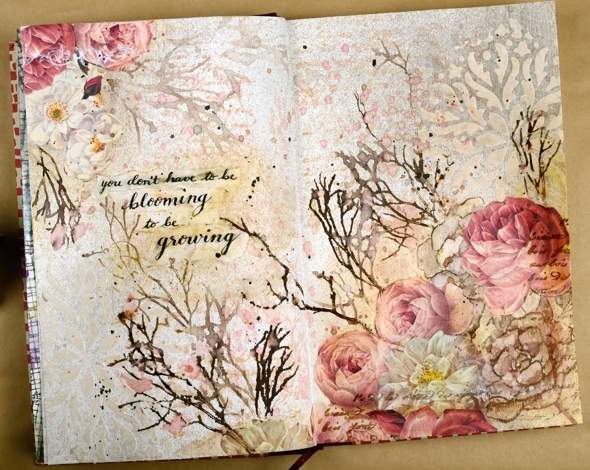 My journal is not watercolour paper so ink and paint don’t move on the page as easily. I didn’t like the roses enough to keep them all, instead I covered some with flowers cut from leftover Italian papers. I glued them on with matte medium and painted diluted gesso over them to decrease the contrast then added a bit of distress vintage medium for the aged tea stain look. 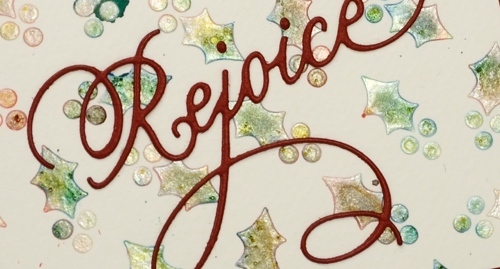 There are an unusual amount of processes involved in today’s card and I will say there are definitely ways to cut corners and get the same effect. It’s a bit like my approach to cooking; if I look at a recipe and the list of ingredients is more than 10, I’m reluctant, if there are multiple processes then I’m not interested! I’m very much a fan of the ‘one pot dinner’. My husband, on the other hand, will create all manner of elements from scratch before even starting the main recipe. 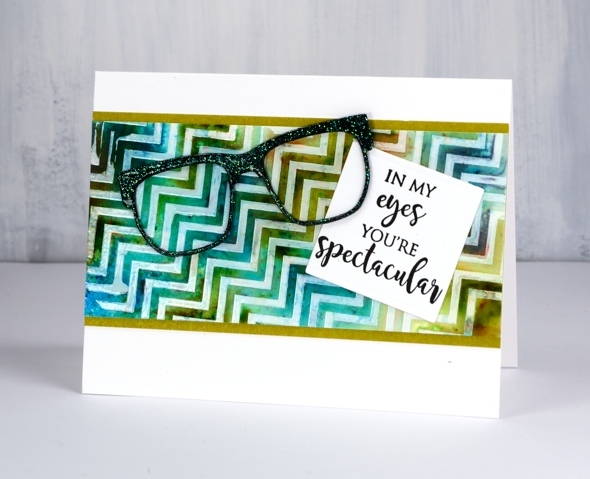 In the case of this card you might happen to have some black and white chevron cardstock to add to the card front. 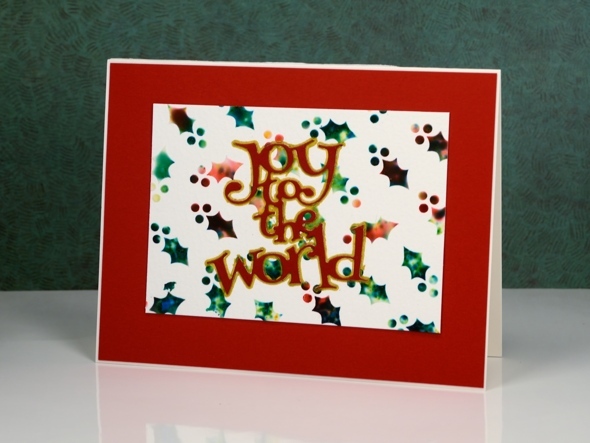 I did not, so I made my own with the Penny Black zigs & zags stencil. My chevron does have the bonus features of texture and shine. I taped my stencil on watercolour paper ( the same type I used for the floral panel) and spread transfer gel over it. I let that dry then lay black foil over it and ran it through the minc. I also ran some adhesive tape over a strip of cardstock and added black foil to that too so I would have a bold strip to position between the chevron and flower panels. 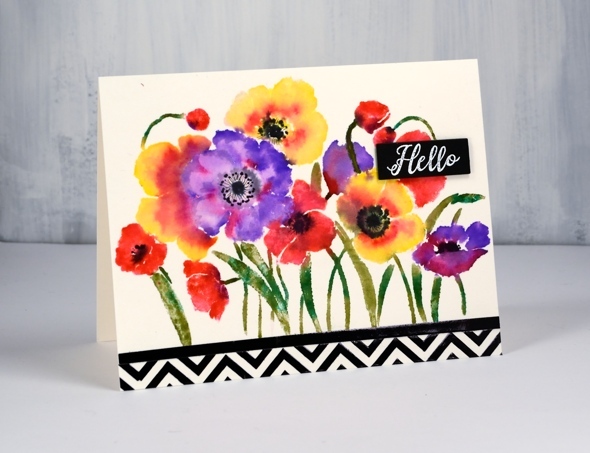 To create my bright and breezy flower panel I put the Penny Black ‘flower field’ stamp in my stamping platform and worked one colour at a time with zig clean color real brush pens. (I remember last time I posted about these pens I hinted that I might just need a few more colours. When I was in Toronto a couple of weeks back I picked up a few more.) 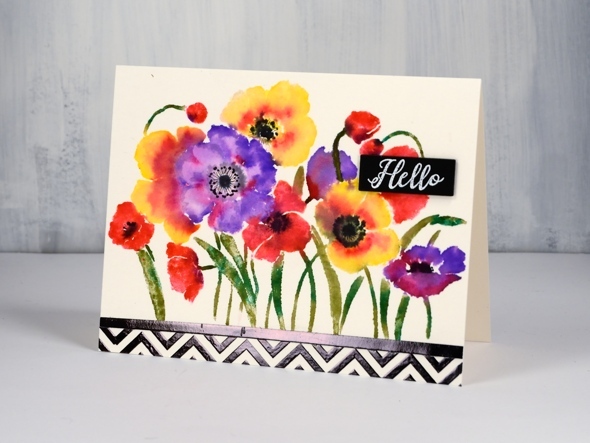 I coloured directly onto the flowers with the pens and was able to add colour over colour as the brush tips are easy to clean off by drawing on a piece of scrap paper. I did spritz the stamp a little before stamping on the hot pressed watercolour paper so the images would be soft and blended. I added some black to the centres while the panel was still damp but dried it before adding fine details with a pigma micron pen. My little sentiment strip is embossed white on black to tie in with the zigs & zags. Thank you for dropping in. Does that background look a little skewed to you? It’s that exact feature that made me use it for an ‘eye sight’ themed card, something you might have to look at with your head on the side. 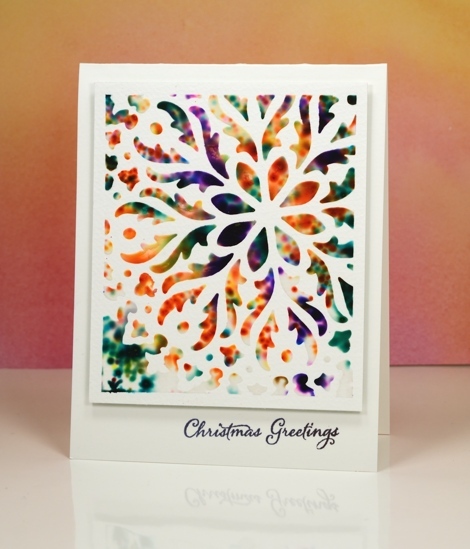 I taped the zigs & zags stencil from Penny Black onto a piece of hot pressed watercolour paper then spread deco transfer gel over. I carefully removed the stencil and let the gel dry. Once dry I lay a piece of white foil over the panel and ran it through my minc foiling machine. The result was a white on off-white chevron panel. 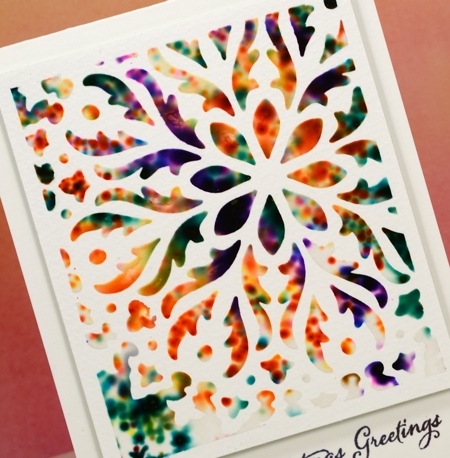 Because I had created it on watercolour paper I was able to use brusho and a spritzer to make a multicoloured pattern. Once the panel dried and I decided on the ‘spectacle & eyesight’ theme. I wanted the die cut glasses to look a little fancy so I added adhesive sheet to the back of black cardstock then cut three pairs of glasses. I was just going to emboss them with clear powder but thought sparkly clear powder might be even better. 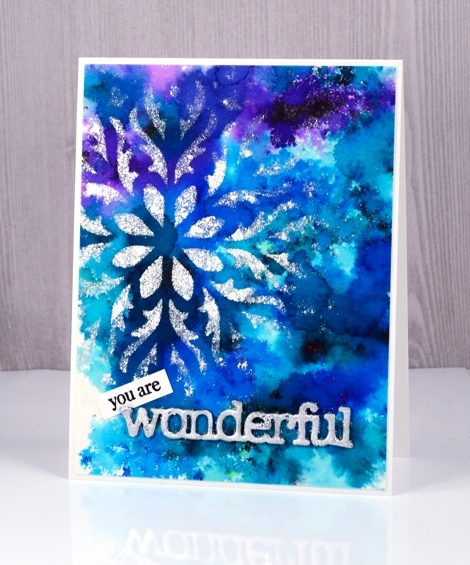 After adhering the three die cuts together in a stack I pressed the top layer onto my versamark ink then dipped it in WOW clear sparkle powder. Even though the powder is clear it ended with a slight green sparkle to it. It looks a little different depending what base colour you emboss over. I pressed the glasses onto my versamark again and embossed in clear powder over the top of the sparkle. 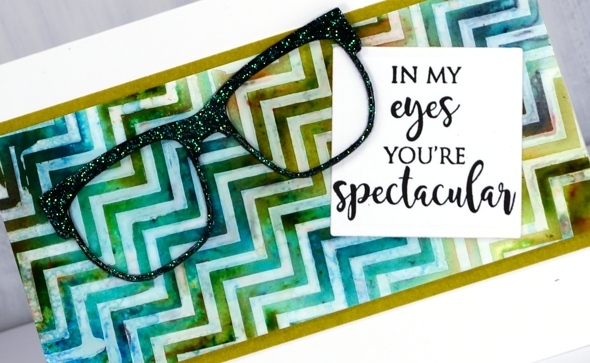 My sentiment is just one of the eyesight themed sentiments in the ‘perspective’ transparent set from Penny Black. 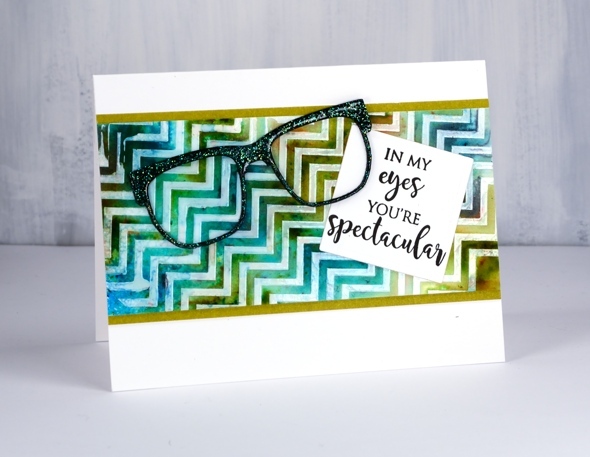 To complete the card I matted the zig zag panel in a co-ordinating colour, attached the sentiment then the glasses and attached it all to a white card base. Not my usual style but I had a lot of fun putting it together. The technique I have to share today is one of those ‘don’t waste all that pretty paint’ techniques. Sometimes I will be creating something and paint or ink ends up all over a mat, stamp or in this case, a stencil after the initial project is completed. 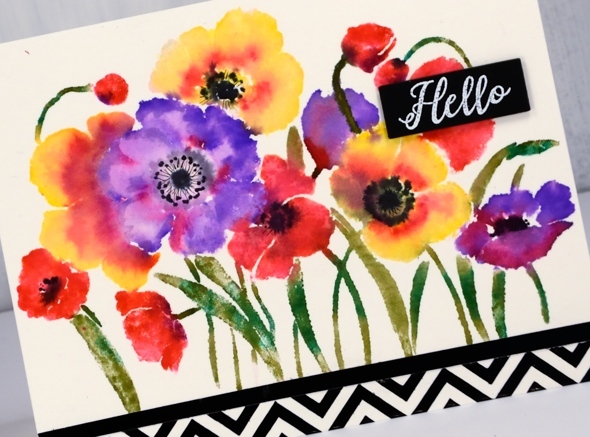 Rather than simply rinse the ink or paint off it is usually worth taking a print or swiping a piece of paper through the excess paint to pick up all the pretty. I was creating panels using the Penny Black stencil, promenade, along with molding paste and brusho paint. Once I had finished sprinkling brusho over the stencil and paste, I spritzed with water before removing the stencil. The stencil was covered in diluted brusho so I pressed it onto a piece of cold pressed watercolour paper and this patterned piece was the result. Incidentally I also made two cards with the stencilled shape on them but they did not photograph well at all. They look fine in real life! I like the ‘negative’ print from the stencil enough that I might just create a negative print as a technique on its own. But then would I end up with a pretty ‘positive print’ as a by product of my creating!?! This post was brought to you from my ‘pile of possibilities‘. 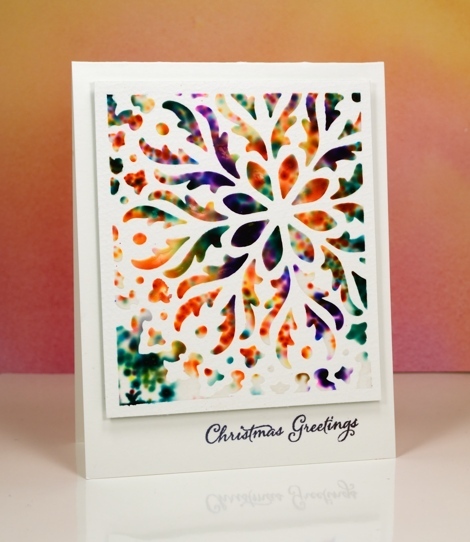 I have a couple more stencilled and watercoloured cards to share today. I used the same technique to create these panels as I did to make the ‘stained glass‘ panel shared earlier in the week. I began with the stencil taped to a piece of watercolour paper then spread molding paste over the stencil to fill all the little holly leaves and berries. While the paste was still wet I sprinkled brusho powder over the stencil then spritzed lightly with water. The water activates the brusho which spreads, blends and soaks into the paste. I removed the stencil and let the paste dry for quite a while before handling it. On the panel below I used a pearl paste instead of white to achieve a shimmery appearance. Water and colour did seep under the stencil in a couple of places but I trimmed the panel to utilise the best portion. I finished the cards with die-cut sentiments and mats. 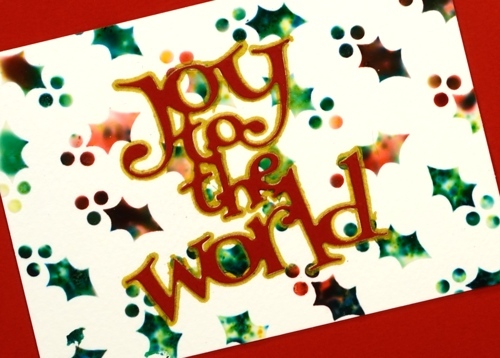 To make the ‘Joy to the world’ sentiment pop I traced around it with a gold gel pen. You can see in the photo below the shimmer from the pearl paste. When I sprinkled the brusho over and spritzed, it really did not look good; it was more of a dirty mustard colour. Once it dried, though it looked pearly with shades of yellow, green and gold peeping through. I apologize if I did not answer your questions about the last post; I’ve been travelling around a bit this week and visiting family in Canberra and Newcastle. When the choice was computer time or duplo with my delightful three year old great nephew, well really, there was no choice! 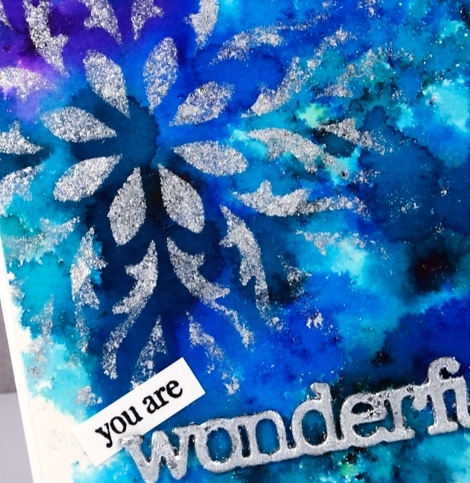 A month or so ago I spent some crafty hours playing with stencils, texture paste and brusho powders. I was spurred on by a friend who had achieved some beautiful results. This panel, which reminds me of a stained glass window, is one of my favourites from that day. I taped the stencil to a piece of watercolour paper so part of the design would be exposed and framed. I spread a thin layer of paste through the stencil then sprinkled brusho paints over the top. With the stencil still in place I spritzed the whole thing so the brusho would react. The result is the blurry, spotty patterns you see below. Once I’d spritzed I carefully removed the stencil and let the panel dry; it took quite a while. Because I had framed the pattern with tape I was able to trim the border to about 1/4″ and then pop it up on a card base and add a sentiment. I am still enjoying my time in Australia with family; I’ve posted a few photos on my other blog, Sentient.